Another example of real life Spanish, we recently took this photo in Buenos Aires, Argentina. What is it? What else does it say? 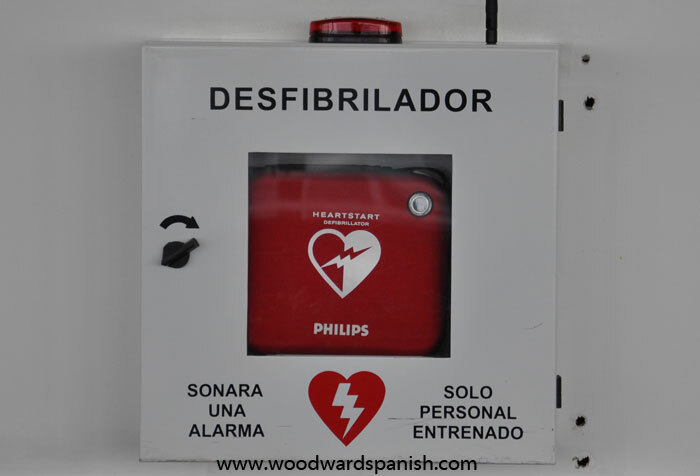 Desfibrilador – (noun – masc) defibrillator (that device you use to give an electrical charge to the heart area in an emergency). SONARA: Notice how they did not put the tilde above to final A to show the verb is in the future tense. Well, in correct Spanish it should be there (see Tildes with Capital Letters) though you may see signs without it. It should be written as SONARÁ.